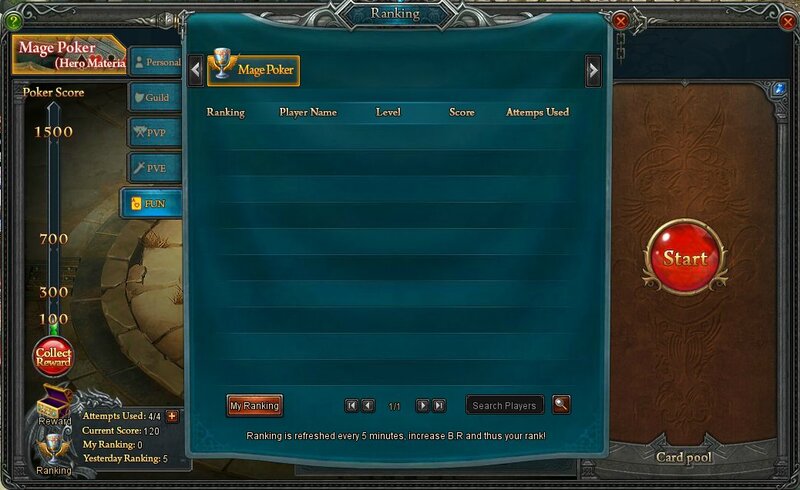 I have to check why rank in Mage Poker isn\'t updated. 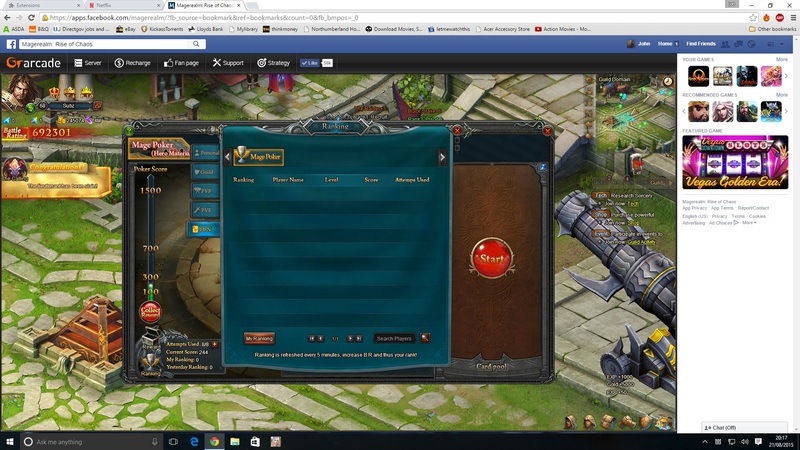 Unless you want to give everyone with over 100 points 20 Anima I and 10 Potential Chests then you should make sure that the ranking are put back before the end of the day to give people chance to compete fairly for the rewards. And no as mentioned before a weak gesture of contrition that is only a fraction of what people could potentially have earned were it not for your mistake is *not* acceptable compensation. 5. Optimized the visual effect in Mage Poker, and added the tutorial. Dear player, we asked our devs for sure, that in order to get on ranking, you need to at least reach 500 scores instead of 200 scores before update. We are sorry we didn\'t make it clear in Update Announcement. I already fixed the thread. Please check again. Thats all fine Cif but what about those of us that spent diamonds to score yesterday??? 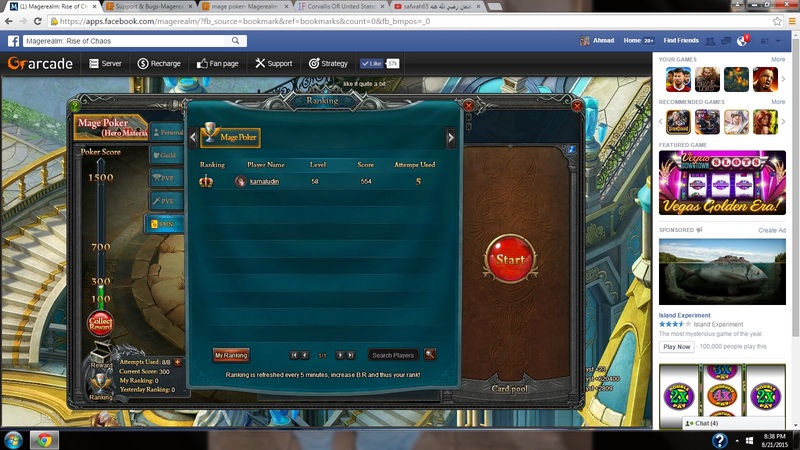 I myself had around 450 points and was ranked and now i didn\'t get nothing at all for my diamonds spent? you should lower the requirements to the 200 points, as without the possibility to get +99 score anymore, it is too expensive to buy so many attempts to get 500 points. On average if you\'re lucky, you get around 30points from each game. So you are lucky if you get over 100points from those 3 daily attempts. That would mean that you need to buy another 12 attempts to try to reach 500point cap. Not sure how the cost increases, but I would say 30,30,45,45,60,60 or something like thats, and it results in around 500 diamonds spent. There is no use of ranking 11-30, 31-100, 100-999 as I\'m sure there won\'t be more than 10 players that spend so much diamonds each day. better roll back this update on mage poker. Now noone will play it. At least could have left the rewards, but now the rewards are around half of what they were. 2019-4-21 10:58 GMT+8 , Processed in 0.062729 second(s), 50 queries .